Kuching, in the state of Sarawak in Malaysian Borneo, is a fantastic place to visit with kids. Not only does the city itself offer an array of activities – I wrote about them in my post about the Top 5 things to do in Kuching – but there are some brilliant things to see and do by taking day trips into the beautiful natural surrounds outside the city. I’m going to list my top five, because I’m in a top five kind of mood. Just outside Kuching, and the Semenggoh Wildlife Centre is home to a bunch of rescued or orphaned orangutans, and their offspring, including some gorgeous babies. 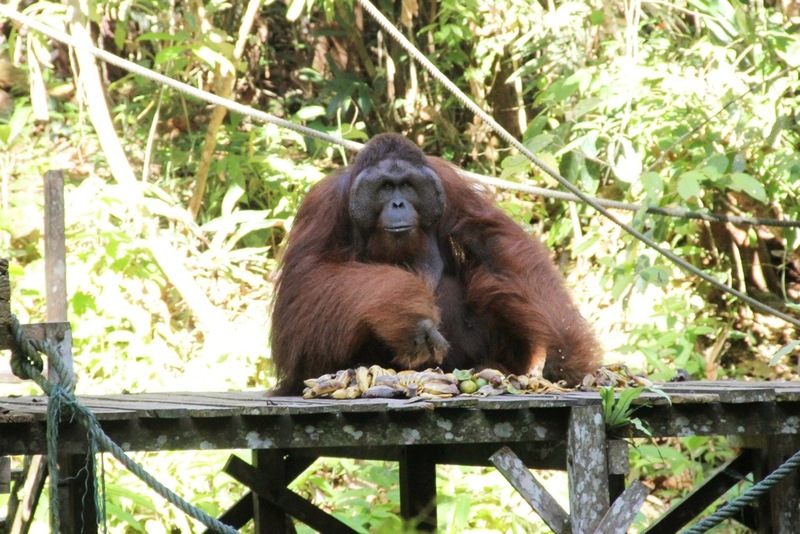 Semenggoh Nature Reserve is around seven square kilometres in area, and the orang-utans who live here roam freely in the jungle of the reserve, coming in at feeding times only if they are hungry. Some of the orang-utans are completely self-sufficient – they find their own food out in the reserve – which is the ultimate goal of the centre. Others come in to feed at the forest feeding platform. There are two feeding times each day, when visitors hope to catch a glimpse of these beautiful and endangered creatures. Feeding times are 9am and 3pm, and each feeding time lasts an hour. We gathered with a bunch of other tourists before the nine o’clock feeding, and were briefed on the behaviour of the orang-utans – and given some tips on our own behaviour. We were entering the orang-utans’ jungle; there are no fences. Don’t get any food out. Let go of your bag if an orang-utan grabs it. Don’t use tripods or walking sticks because they look like guns. Don’t stare orang-utans in the eye. Following the guide, we walked along a forest track for around five minutes, and gathered on a wooden viewing platform, facing another wooden platform. The guide then began calling the orang-utans in. After around five minutes of calling, and thinking maybe we were out of luck, we could hear the cracking of branches in the distance, behind our platform. As the sound got closer, we had to move off the platform, in case the approaching orang-utan decided to take to the ground. 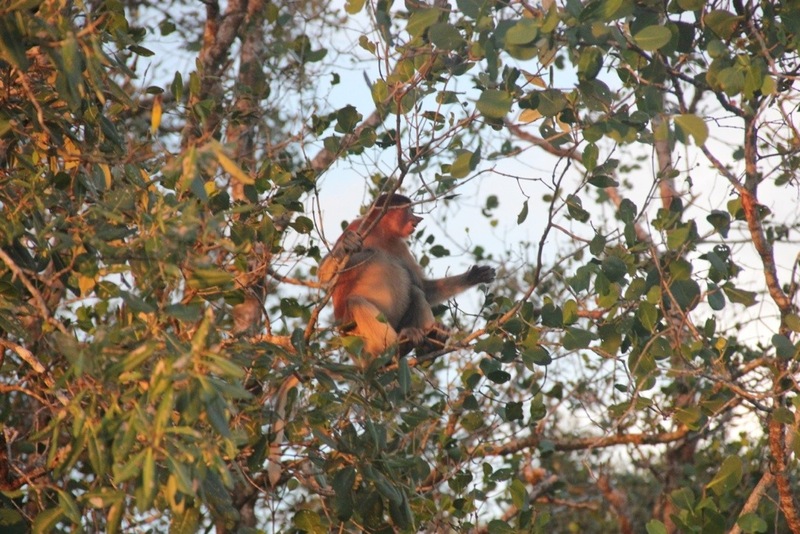 The noise in the branches continued, until overhead we could see flashes of orange as an enormous male orang-utan came through the canopy, then along a rope from high above, and sat down on the platform. We looked at him. He looked at us. We took photos. He ate bananas. We were a bunch of animals checking each other out. He then decided to take a stroll up the path back towards headquarters. The kids loved how he just walked up the track. After a suitable amount of time, we followed him to another section of forest, where we were lucky to spot a mum and her baby. Majestic! Coming to Semenggoh was one of the reasons why we decided to come to Borneo. Steve and I visited Sabah, Malaysia’s other state in Borneo, ten years or so ago, and saw these beautiful apes at the Sepilok Rehabilitation Centre there. To give Phoebe and Blake the chance to see orang-utans, a seriously endangered species, in the wild (well, semi-wild), was one of our goals. The kids were in awe. So were we. What an experience! How do you get there? You can take a local bus from Kuching. It takes around 45 minutes. 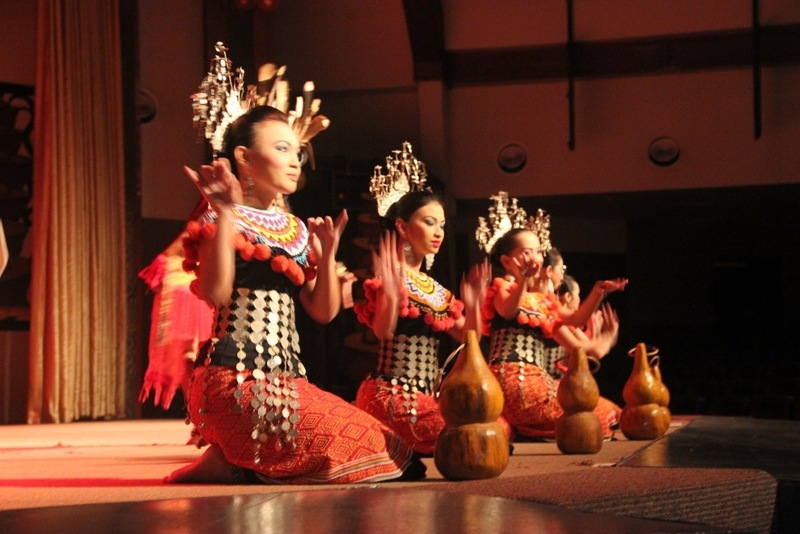 There are also a bunch of tour companies that organise excursions around Kuching. With them, you can pair a visit to Semenggoh with a kayaking experience, visiting a longhouse, or some hiking, for example. There are a heap of operators, but a special shout out goes to Laurence and the team from Borneo Experiences. I popped in for a chat with Laurence in Kuching to ask about possible day trips, but because Miss Phoebs wasn’t likely to go gladly into a kayak (read about our boating experiences in Santubong), and neither of our four-year-old twins are ready for proper hiking, he suggested that rather than taking an adventure tour, we should just hire a taxi for the day to take us to Semenggoh, and some other sites of interest. He even hooked us up with a reliable taxi driver! So for 200 RM (about $70 Australian) we had a taxi for a whole day, with an English-speaking driver, who drove us about the countryside. And Laurence organised it for nothing! Next time we’re there, we’ll be kayaking with Borneo Experiences for sure! After Semenggoh we jumped back into the cab with our local expert taxi driver William, and headed for the Bau region, about 45 minutes away. There are two caves to visit in the area. The Wind Cave is a series of three dark tunnel caves filled with insect-eating bats and their stinky guano, but the kids enjoyed it. Our favourite, though, was the magical world of the Fairy Cave. After climbing an enormous concrete staircase from the road level (I am not exaggerating when I say it’s around 300 steps – we counted them on the way down – but it’s SO worth it), you arrive here. That green is really that green, and that cave is really that dark, and those gorgeous winding steps disappear into blackness, and you have no idea what you are going to see when you enter. And then truly arrived in fairyland. Moss and tiny ferns cover the ground, as the enormous cave entrance, which is 30m above the road on the cliff face (hence the climb to get in), lets sunlight into the cavern, which is massive. Water drips from above, feeding the little plants, and bat poo provides a fertile soil. It’s one of those places that you really have to see to believe. Steep cement staircases wind around the cave, and up to the cave entrance. 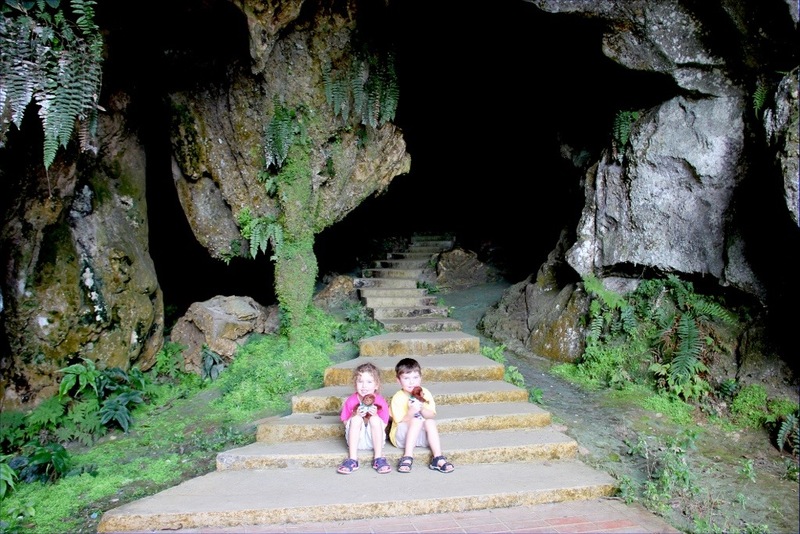 We firmly gripped the kids’ hands on the rail-less stairways, and wandered the cavern. The view from the entrance looking back into the cave is spectacular. Indescribable. Mother Nature, you’re amazing! Phoebe kept asking where the fairies were. I wouldn’t be surprised if they were hiding under those tiny fern fronds. If you’re ever in Kuching, you MUST go to the Fairy Cave. We visited Sarawak Cultural Village, located on the Santubong Peninsular, at Damai, when we stayed at Permai Rainforest Resort, but you can also reach is as a day trip from Kuching – it’s only an hour’s drive away. Known as a local “living museum”, the village features the traditional buildings of the indigenous people of Sarawak, including a full-scale Bidayah longhouse. This is the Orang Ulu longhouse. The kids received a passport and they collected stamps from the various houses. There were locals at each house to give a little demonstration of traditional cooking, or jewellery-making or weaving, which was lovely. They were smiling and friendly. 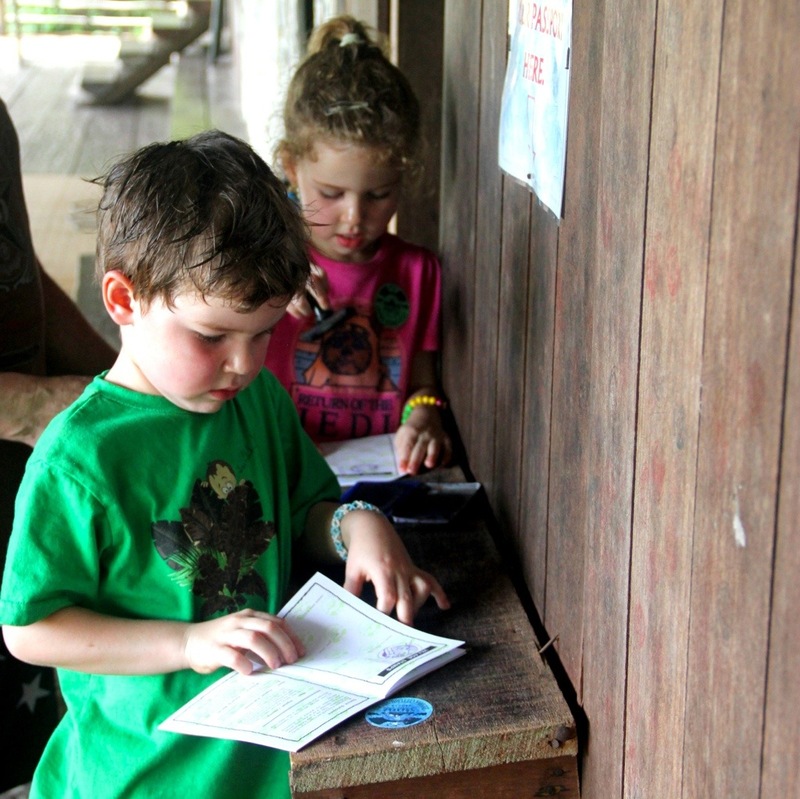 Phoebe and Blake enjoyed collecting stamps, and it became a bit of a race around Sarawak to collect them. There was a cool bamboo bridge. And a cultural show of dance and music is on at 11am. 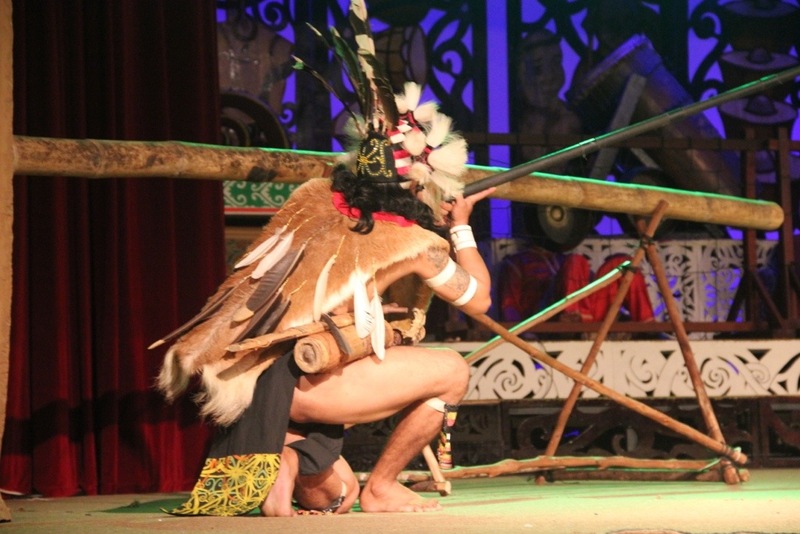 This was a talented Orang Ulu blowpipe hunter, who successfully shot darts at balloons from a distance. The cultural village is a great half day trip from Kuching, or stay the day and visit the beach at Permai Rainforest Resort just down the road – they have cheap day rates to use the beach. See my post here for the beautiful rainforest and beaches on the Santubong Peninsular. We took a mangrove tour when staying on the Sanubong peninsular, but lots of the tour outfits in Kuching organise these boat tours as day trips, too. Spot Irrawaddy dolphins, proboscis monkeys, crocodiles, and firefiles. Read all about our trip on my post “Dolphins, monkeys and fireflies… and why do we need a life jacket?” – it was a massive highlight of our time in Borneo. We didn’t do this, but if we didn’t have a four-year-old who was scared of boats, we would have. 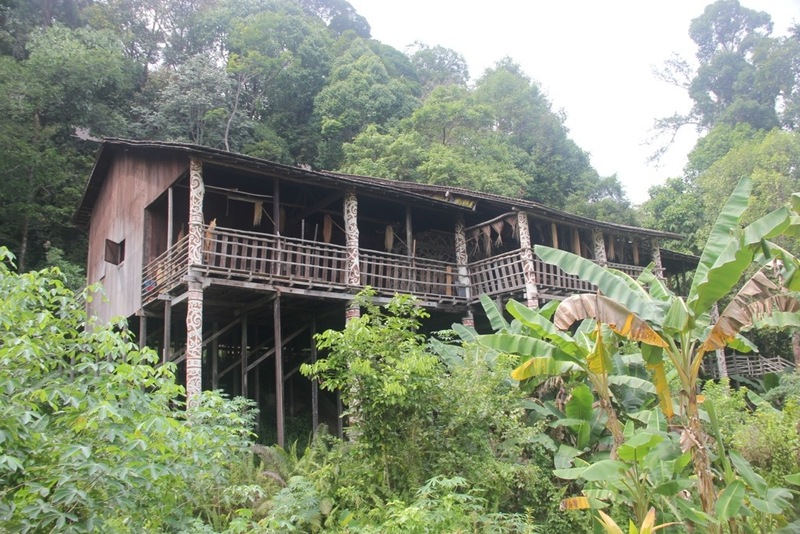 Borneo Experiences offer a tour called “Primates, People and Paddles” where you visit Semenggoh, then the Annah Rais longhouse, in the Penrissen mountains where Sarawak borders Indonesia. The building is estimated to be two hundred years old, and Bidayah people still live here. Annah Rais features a traditional Headhouse, lined with human skulls from the tribe’s headhunting days. After mingling with the locals at Annah Rais, you drift leisurely down the river in kayaks, picnic on the riverbank and swim in the river, spotting wildlife along the way. What a perfect way to spend a day! Older kids would LOVE this. And there you have it! A bunch of awesome day trips around Kuching, with kids, or without. You get that we loved the place, right? No wonder Blake said he missed Kuching as we flew out over the city – it was amazing. Thanks for having us, Kuching! Want more? Here are my top five things to do in Kuching city – the river, the temples, the cats, and more! If you want to know more about travelling in Sarawak, visit Sarawak Tourism, or find Sarawak Travel’s great page on Facebook. Read about more of our Malaysian adventures in Kuala Lumpur City Centre Park, KL Chinatown, Batu Caves, staying on the Santubong Peninsular in Sarawak, our wildlife-spotting boat trip in Santubong, and things to do in Kuching. Linking up for Travel Photo Thursday #TPThursday with Nancie from Budget Travelers Sandbox. Pop on over and read some other great posts if you have a spare few minutes. Oh Rachie, wish you could have come with us!!!!!!!! Not sure where we’re going next, but you’ll be here soony! Fairy Cave looks interesting. Reminds me of Batu Caves in KL. I love caving! Didn’t your kids get scared though? It looks so dark! Haha, funny you say that. 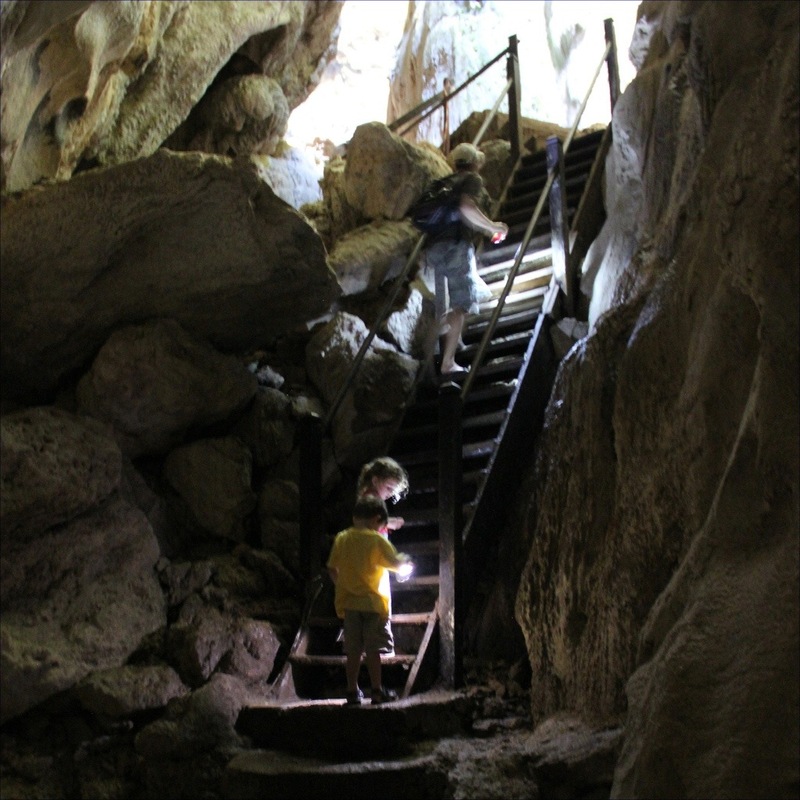 Despite Phoebe being scared of boats, and lifts (yeah, elevators – Daddy got left behind one time and after that we all had to hold hands in a circle to go in, otherwise serious screaming would occur), she was perfectly fine entering pitch black, bat-filled caves! The dark bits didn’t go on for too long, and there were paths, so it was fine. So beautiful and worth the stairs! What an amazing day trip! I can imagine how your 4-year olds would be in awe of those orangutangs; I was ingreat awe just seeing them in your photos. And my goodness, that cave looks magical. Too bad you didn’t get more photos. Well, I guess I just have to go to see more of it myself. Love the photos of Phoebe and Blake stting on the stairs. I hope Phoebe outgrows her fear of little boats. Yeah, the kids are lucky to have seen the orang-utans, and the cave. It was definitely disappointing when the camera died, but I now I have to try harder to remember it – which is maybe not a bad thing. I have seen lots of pictures of the cave, and none of them do it justice, so I am not too disappointed. 🙂 We did a little boat trip a couple of weeks later, and Phoebe was ok. I think she just needed to be reassured it was all safe. I’ve never heard of Kuching. It looks like a fabulous place to visit! Pretty cool tour. Hope you get to visit the longhouse next time. It’s not too far away, and there are cheap airfares! It could be you 🙂 Haha! Thanks Leanne, they’re my favourites, too. They sure are lucky kids. Hi, It’s me again – I have been roaming around your site and really like it. I wanna see the fairy cave! Thanks, Jan. Yes, the Fairy Cave is amazing. Have you been to Borneo? It’s not too far from Oz! We have been for the day in Brunei on a stopover and had a look around. Brunei evidently is a soverign state in Borneo (I am confused), anyway we have not been anywhere else in Borneo. I have researched it for one of my facebook fans who wanted to go and it looks very interesting. I’ve done the orangutan sanctuary, the cultural village and boat tour, but we never got around to kayaking or the Fairy Cave. I really wanted to do the cave, but we were only there for a few days and couldn’t squeeze it in. Looks fascinating! I bet your little explorers would love it! It’s amazing how many diverse things this area offers. I love that they’re all family-friendly too. I’d be a little leery around the orangutans but how fun would that be. All this wildlife sighting, fantasy cave and cultural activities has just put this on my travel wish list. I can’t rave enough about it – lots of great activities easy to reach, plus more intrepid stuff if that takes your fancy. Yeah, we were a bit wary of the orangs, but as long as you follow the rules, you’re ok. Thanks for stopping by, Mary! 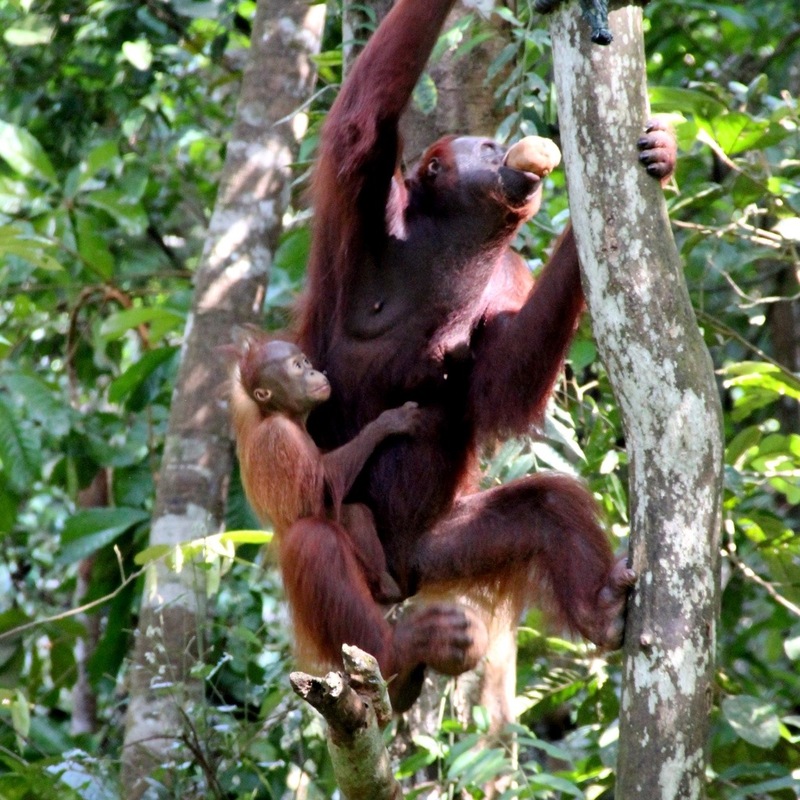 what a great experience for your kids to see the orangutans! 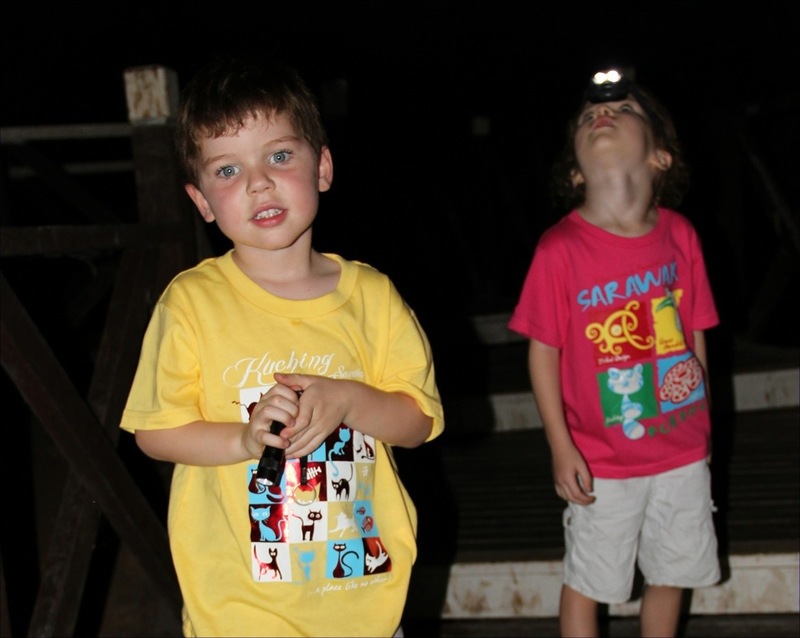 what a great trip, and how awesome for you taking your little ones on such an adventure. Thanks Eileen, yeah it was a great adventure for the little ones. Can’t wait for the next one! Gosh that was up close and personal with the orangutans! Love how they are allowed to be free in an area, and are so well looked after. That fairy land cave looks incredible – so very green and its almost look like something out of a movie or book. That trip sounds incredible…the bridge, the walking, the boat trips, the taxis, the cultural show and the dancing….there would be so much there to see that one would never want to leave! 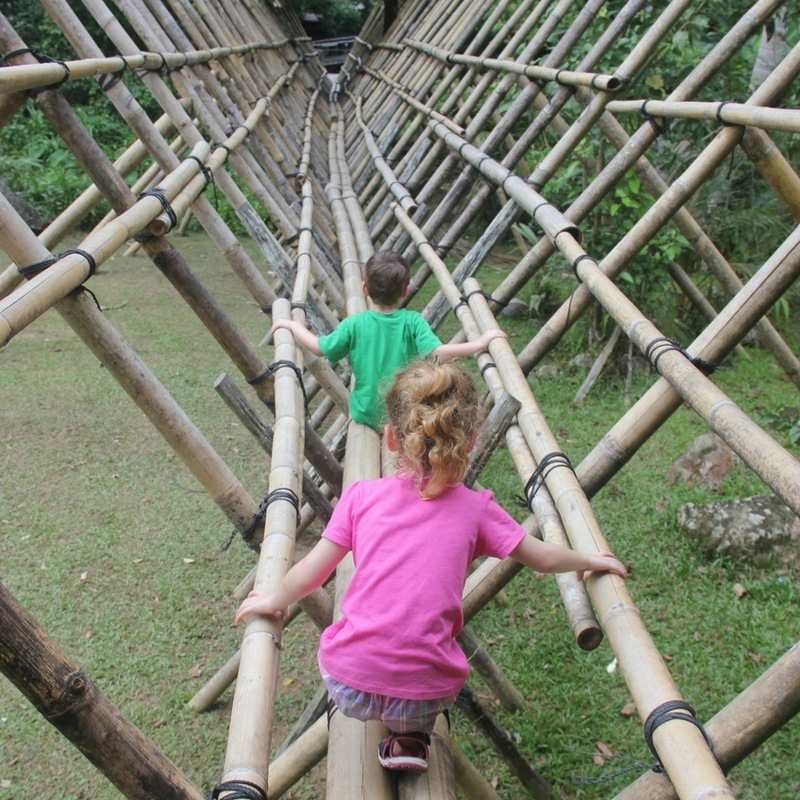 Kuching sounds ideal for little explorers – even when they are too little to walk long distance. Kuching was fabulous for the little ones – lots to see nearby. You’re right – it was difficult to leave! What a fantastic experience! I’d love to visit the Orangutans in Borneo! One of these days…for sure! Thanks for sharing your adventures! It was awesome. The orang-utans are waiting for you, Grace! Hello this is such a cool post, I am so envious! I spent time in Kuching when young, free and single and it was great. Would love to go with the kids sometime. Your articles are such a great guide for anyone planning a journey there with children – a fantastic resource. We never made it to Kuching pre-kids, but it was worth the wait. Thanks for the feedback! I enjoyed reading your Kuching trip blogs… We are going there for a week long trip; your top five lists are now on my to do list! Thank you.. Wonderful! We loved Kuching. Enjoy! Hi Kaleena. Yes, we had a taxi for the day and visited Semenggoh, the Bat Cave and Fairy Cave. It cost 200RM which at the time was about $70 Australian dollars, so it was quite reasonable for the four of for transport for the day. Laurence at Borneo Experiences hooked us up with a reliable taxi driver. Have a fantastic time! Kuching is amazing! A number of my blog readers have complained about my site not working correctly in Explorer but looks great in Firefox. 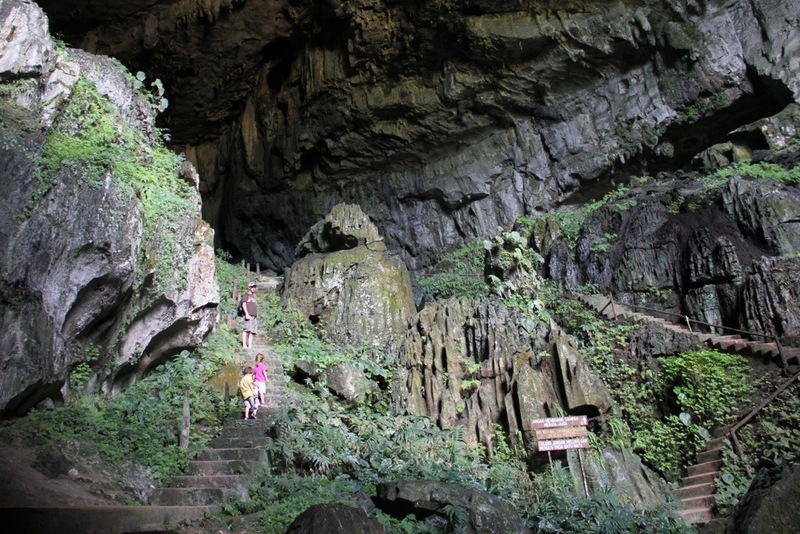 Looks so beautiful – did you go to Semenggoh and the fairy cave direct from Permai? Did you have any issues getting transport? We’re planning a trip and I’d love to stay there, but want to go see both these things!! Hi, I’m fy, A master student from Unimas in Kuching. Now I am doing a study in Bario, Kampung Annah Rais and Kampung Mongkos in Kuching. I found that you ever been to Kampung Annah Rais before. Therefore, I would like to invite you to fill a survey regards service quality in Kampung Annah Rais and yours satisfaction and destination revisit intention to serve my thesis’s purpose. I would be very appreciating that if you can give a hand to help. You can fill the questionnaire using the link as shown as below. Thanks. Who want to visit kuching sarawak, malaysia, you can call @ whatsapp eefah (+60165751266).. She can arrange everything for you.. She can find a reasonable price.. Homestay, trips to… (bako national park, wetland, cave’s, etc), transportation (car@skuter) and driver.. You can also ask any suggestion if you want.. She’s very friendly.. Your visit will be fun. 2 to 3 days is definitely not enough to stay in kuching .. Reallllyyyy awesome!!! !